In many of my postings on various Internet Blogs and Forums, I have referred to myself as a Nutritionally Cured Holistic Survivor in order to differentiated myself from other 'cancer survivors'. During all my research following my initial diagnosis, I discovered the VAST array of information, that my doctors never mentioned, I hadn't heard from the media or anything else. It was almost an 'underground medical practice; which I have found out is not really that far from the facts! As conservatives promote Freedom, Truth and Justice, there didn't seem to be much discussion about Health & Wellness. The only thing you heard was 'anti-Obamacare' discussions, no one was FOR or promoting Health and Wellness and commenting on the corruption in the regulating bureaucracies (FDA, AMA, EPA and others). 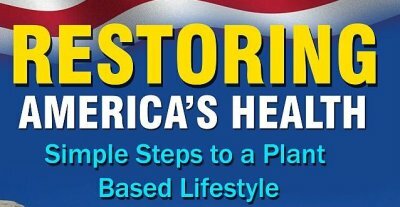 There were no groups or organization in the political arena there promoting Health & Wellness as a way to dramatically REDUCE healthcare costs. No discussions about suppression of Organic Farmers, subsidies to Huge Multi-National Global Agribusiness concerns. No discussion about suppression of curative modalities for Heart Disease, Cancer, Diabetes 2 (the BIG-3); even though there have been a recent TV Specials (CNN and others) like 'The Last Heart Attack' and others that present curative modalities that traditional medicine define as 'incurable'! There was no discussion of the massive expense of Farm Subsidies that mostly promote very unhealthy nutrition! According to the Huffington Post article of 9/22/2011: "According to the study, a whopping $17 billion of the total $260 billion the government spent subsidizing agriculture went to just four common food additives: corn syrup, high fructose corn syrup, corn starch and soy oils. By comparison, the government spent just $261 million subsidizing apples, and far less still supporting fruits and vegetables, like spinach, broccoli and blueberries, that public health experts say encourage better health. To put things in perspective, the PIRG study said that, if the government had given taxpayers the subsidies instead of the farmers, each one would have been given $7.36 to spend on junk food and just 11 cents to spend on apples a year. This is a key factor that makes junk food more expensive than healthy food -- and, by extension, that makes many Americans obese." The examples go on and and on. We haven't even discussed Drugs, Medicines, Genetically Modified and untested food products. Nor have we hit on the lousy labeling practices in most consumable food products. We haven't mentioned the disastrous environmental pollution of the Gulf of Mexico 'Dead Zone' off our Southern Coast! Do all these things sound like 'Liberal' talking points, the 'Green Movement' etc.? Well we may actually have some common ground, but just differ on how to correct the problem! We eat junk food and get sick, we poison our environment and get sick, we take prescription drugs and get sicker, we listen to bureaucrats who try to tell us how to live, what to eat and what treatments to accept and get sicker and no one questions the source, motivation or validity of the statements. No one listens to the drug commercials much that list the side effects of these advertised treatments for diseases that are mostly manufactured, just like the drugs to treat them are. Death, heart attack, depression, suicide, etc. Doesn't this disturb anyone? Why in the world would you take this stuff when, in many cases aspirin would do the trick? MONEY! Always follow the money trail! Finally we come to the purpose of this site and the group/organization I intend to promote. I want to gather alternative and organic farmers, food producers/distributors, holistic groups, practitioners and medical professionals to promote Health and Wellness. In order to do so, we have to fight entrenched bureaucratic groups and agencies who are well funded and controlled by massive Global Corporations. It is a fight of Right against money, power and corruption. We will try to inform and educate by presenting and promoting definitive information sources, experts and individuals who have and want to promote the Health and Wellness of the American People, Our Country and, yes the Planet! We are destroying ourselves and the Planet we live upon. This is truly a fight between life and death just as much as it is about Freedom and Liberty. How can we be Free if we are dying? Health and Wellness is the very foundation of all we strive to accomplish. Without Health and Wellness we have nothing to fight with! Without Health and Wellness we have nothing to fight for! Are you a supporter and lover of our animal friends; join us as well! By focusing on a Plant Based Lifestyle, we will by definition, decrease the consumption and mistreatment of animals. We will improve the environment by decreasing the lost forests cut down to provide grazing lands for animals for food. Reducing the number of 'feed lots' and animal slaughter houses/plants we will further reduce the pollution and runoff from these barbaric sites. Fighting GMO contamination of our Food Supply? Join us to combat the corporate drive by Monsanto and others to CONTROL the Planetary Food Supplies. Yes if they can patent life and control seeds they CONTROL FOOD. GMO forces the increased use of pesticides (and many GMO crops have genetic poisons/toxins imbedded), spawn super bugs and super weeds never known before. Increased allergies and other ailments may indeed be traced back to the introduction of GMO crops and resulting products into the Planetary Food Supplies. GMO producers may well be the inheritors of the next 'tobacco like' law suites in the near future as they persecute farmers whose natural crops are contaminated, the GMO pesticides kill bees and worse, the resulting GMO products may well be poisoning those who consume them. Join us to gather our abundant and varied resources. Try to put aside specific agenda's and organize as a true force of change to roll back the corruption, greed and destruction being promulgated by corporations and agencies who have no desire to cure, but only to treat disease. Corrupt corporations and partners in government have NO desire to provide healthy nutritional food, but only to make easy money by the cheapest and most subsidized means possible. These companies have NO desire to provide freedom of choice in our food and sustenance options, but only control the Global Food Chain. Please view the other sections of this web site. Ask Questions! Seek Answers! Join Together to promote Health and Wellness!